Note: I researched and purchased the product described in this review on my own. I was not contacted or compensated by the manufacturer in any way. When I was in the drugstore recently, these bright little pans of eyeshadow caught my eye. I loved the attractive matte grey packaging and the gorgeous rich shades, and I always appreciate the ability to buy single colors so I don't get stuck with half a palette I never use. 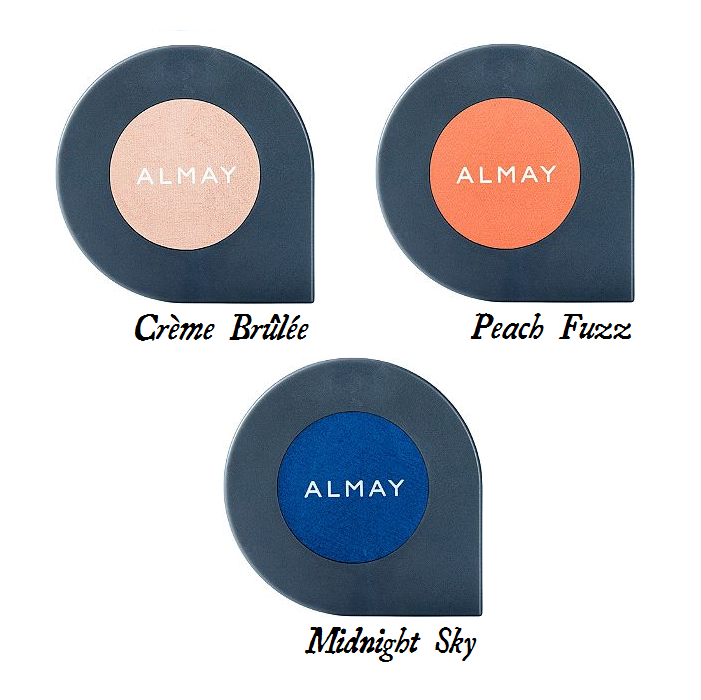 Since I needed to replace my year-and-a-half-old eyeshadow anyway, I decided to give Almay's Shadow Softies in Crème Brûlée, Peach Fuzz, and Midnight Sky a try. One of the most interesting things about these shadows is their formula. Almay describes them as "whipped powder," and prior to trying them I couldn't for the life of me figure out what that meant. I currently use whipped blush, but it's a cream formula, and whipped cream is a texture most people are familiar with. But whipped powder--how does one even whip powder? I'm still not sure, but I can say that the texture is unlike any other cosmetic I've ever tried. It's powdery in the pan when you first use it, but applies something like a cream and gets creamier as you use it more. I used regular brushes to apply it, but I think sponge applicators might pick up the product a little better. Formula curiosities aside, I loved the texture and finish of the Shadow Softies. They're sheer, which I prefer in an eyeshadow, but the color is clear and true even when applied lightly and can be built up for more intensity. The shimmer levels vary from color to color, with Crème Brûlée being the most shimmery of those I've tried and Peach Fuzz the least. None of them were too glittery or pearlescent, making them good for daytime wear, but they all had enough shimmer to keep them from looking chalky. I was very pleased with how the Shadow Softies wore, too. I don't wear primer or foundation beneath my eyeshadow, but Crème Brûlée on the lid, Peach Fuzz in the crease, and Midnight Sky beneath my lower lash line all held up for six hours without fading or smudging. The shadows are hypoallergenic and ophthalmologist-tested, and didn't irritate my somewhat sensitive eyes and skin. The Shadow Softies are free of parabens, too, which I always appreciate in a cosmetic product. On the whole I was very impressed by Almay's Shadow Softies, especially considering that they're an inexpensive drugstore product. Their look and feel is just right for my style and skin type, and because of that I can see myself wearing these shadows more often than I wore my old products. Who knows--I may just run out of these before another year and a half is out!